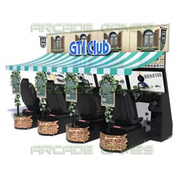 Welcome to Arcade Games, Australia's premier distributor for amusement machines and arcade parts from leading manufacturers such as Sega, Namco, Konami, Taito, Capcom, Gaelco, Comestero. We have for sale a range of products including video arcade game machines, amussement machines, pinball machines, redemption machines, arcade cabinets, arcade game boards, arcade PCB's, and conversion kits for arcade machines. We also have for sale a comprehensive range of spare parts to suit amusement machines, pinball machines, redemption machines and much more. We ship worldwide from our Australian and overseas warehouses; and our 28 years of experience in the arcade and amusement industry means you are guaranteed exceptional quality, customer service and reliability every time. Please browse our online catalogue to view our full range of video arcade games, arcade game boards, and arcade spare parts for sale. If you cannot find a particular product on our website, please contact us and we will chase it up for you. 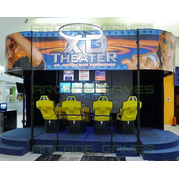 The XD Theater is a 4D motion ride experience from Triotech. It has a wide range of applications for a highly immersive experience through Triotech's 'MWM Seat Advantage' which features subtle sensations and intense vibrations in its simulations. Lifetime license on movies. Highway 66 puts a whole new spin on the game of Ten Pin Bowling, combining traditional ten pin play with arcade gaming. Players can partake in a series of four arcade games which include new rules and tricks to learn. 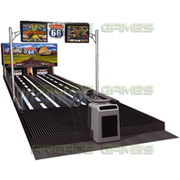 The games are displayed above the 2 lanes on video screens and compliment the traditional ten pin bowling game play. 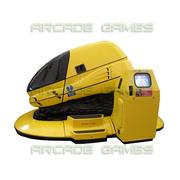 The Venturer S2 Simulator features theme park quality simulation technology in a compact 2 player arcade simulator machine, making it newly accessible for arcade centres and other commerical locations. Up to 2 players ride in the futuristic Venturer S2 capsule as they enjoy a selection of 5 different movie ride experiences. The visuals come to life thanks to to the S2's fully integrated motion system, wide screen display and crisp sound quality. GTI Club Supermini Festa! marks the return of a classic racing game series. Like the original, players race small cars including the Mini Cooper. 38 inch high definition monitors, Japan made machines. Take your Metal Gear experience to the next level with Metal Gear 3D Arcade Edition! 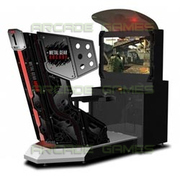 Metal Gear 3D Arcade is a reworked arcade version of Metal Gear Online - 4 units linked together. Road Fighters is a 3D racing game from Konami. The game is a highly anticipated sequel to Konami's original Road Fighter which was released in 1984. The cabinet has a set of 3D glasses mounted to the machine and two 'peep-holes' built into the seat to allow spectators to view the action in 3D also. Players can also play the game in 2D and can switch between 2D and 3D modes with the press of a button. 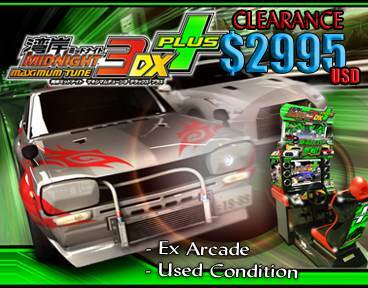 Maximum Heat 3D Arcade Machine is the Japanese version of Dead Heat, a head-to-head street racing game from Namco. 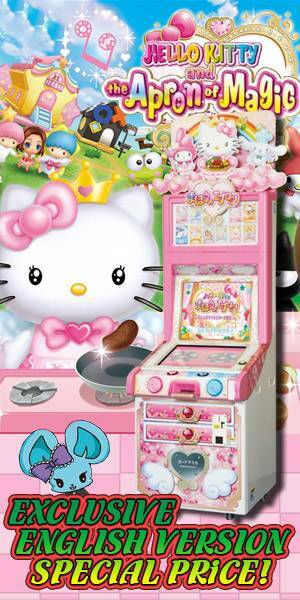 Hello Kitty and the Apron of Magic is a cooking themed card collecting game manufactured by EXAMU and licensed by Sanrio. The goal of the game is to create tasty meals using ingredient cards dispensed by the machine. A ticket redemption machine from Sega, as part of Sega's "Redemption Zoo" series of games. The machine includes colourful, cute graphics which are sure to appeal to children of all ages. Tekken Tag Tournament 2 (TTT2) Deluxe Arcade Machine Set with Live Monitor Kit includes 1x 32" LCD twin cabinet, Live Monitor complete machine and networking equipment. Key features include worldwide networking through internet, Namco's new "Bana-Passport" player cards and live monitor data feature offering regular new content to the machine (new characters, arenas, combo moves...). The Hopping Road Mini arcade machine is a 2 player pogo stick cartoon simulator game. Perfect for children. Go Go Grand Prix is an arcade slot car hybrid racer. Unlike traditional slot car racers, these cars don't come off the track! The amount of pressure applied to the simple hand controller determines the speed of the slot car. A gigantic arcade adaption of the classic Tetris puzzle game. 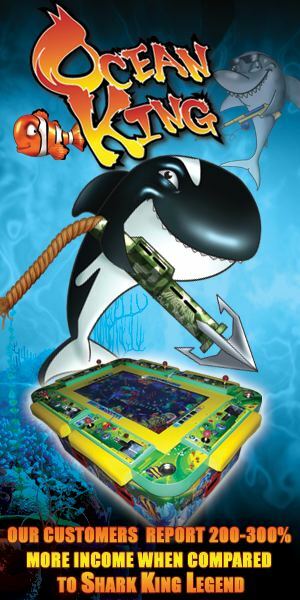 Includes a co-operative play mode where two players can play together, as well as a versus mode. A 2D fighting game developed by FK Digital and published by Sega. Features a variety of anime-inspired characters, with great cel shaded graphics. 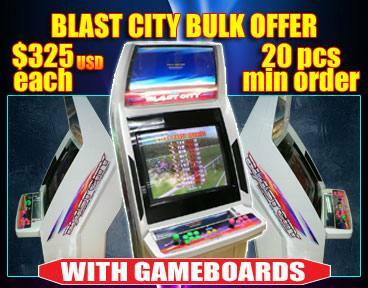 TouchFX is a touchscreen video arcade game with ticket redemption option. TouchFX offers players the opportunity to experience the most popular Apple iPhone and other mobile phone games on a huge 46" colour multi-touch touchscreen monitor. 3 Player version with three touchcreen monitors. Classic American Road Trip is a bright and exciting coin pusher machine. This dedicated ticket payout, single player pusher is themed around the classic Hollywood to Chicago Route 66 and features a unique bonus feature that result in big ticket wins. Tekken Tag Tournament 2 (TTT2) Super Deluxe Complete Arcade Machine Set includes 2 32" LCD cabinets, Live Monitor machine and all versus and networking equipment. Key features include worldwide networking through internet, Namco's new "Bana-Passport" player cards and live monitor data feature offering regular new content to the machine (new characters, arenas, combo moves...). Pigs Might Fly is a video ticket redemption game from Sega Amusements USA. With bright, colorful graphics and a moveable action lever, children and adults alike will be entertained by this animated arrival. X-Rider uses a 6DOF motion system to produce the most dynamic experience for the rider. Add in 3D movies, wind, bubbles, snow and strobe effects and X rider is a truly unique experience. And because X-Rider is available as a 4 player set up and is easy to install, you really can be enjoyed in any size location! A four player Pac-Man game, built in the style of a classic cocktail cabinet. Each player takes control of a Pac-Man (Yellow, Blue, Red or Pink). The object of the game is to survive the longest and win the round. Transformers Pro Pinball machine will come in four versions of this game out there, Pro (the standard version), Limited Edition and then separate Autobot and Decepticon Limited Collector's Edition cabinets. A 1-2 Player crane machine from Taito. A pinball machine from Stern themed around iconic rock band The Rolling Stones. The machine takes players through four decades of Rock 'n Roll history. 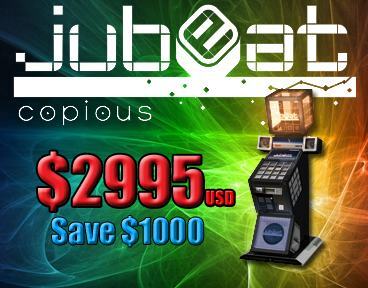 Jubeat Copious Arcade Machine is latest version in Bemani "Jubeat" music video game series. A ticket redemption game from Sega. Stop the swinging pendulum to win tickets and hit the bonus target to enter the cuckoo clock. Release the cuckoo bird to win the jackpot. Arcade Games is a part of the Highway Group.